Southern Sudan’s government revealed this week a multi-billion dollar plan to build new urban centers in all ten of its state capitals. The price tag may make some gasp, but the real surprise? The cities would be animal and fruit-shaped. The $10.1 billion plan proposes remaking cities in Sudan’s south into shapes found on regional flags. 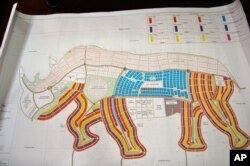 Blueprints and maps illustrate Juba in the shape of a rhinoceros, Yambio fashioned after a pineapple and Wau as a giraffe. The Undersecretary for Housing and Physical Planning, Daniel Wani, says he hopes the plans will demonstrate the housing ministry’s desire to think creatively about how to remake southern Sudan for the future. “This is very innovative. That is our thinking. It is unique,” says Wani. “It is from the Ministry of Housing thinking innovation; that we have to be different, so that people can see what we are trying to tell them. But the plan may also send a very different message – one about the planning capacity of a government still trying to recover from decades of war. A lack of government oversight is already thought to have resulted in the loss of billions of dollars through corruption and poor management since the war between northern and southern Sudan ended in 2005. Southern Sudan’s total annual budget this year is less than $2 billion. But the ministry says it can get the additional funds needed for this project through private financing. Wani says it is important that the plan go forward in order to reinvigorate southern Sudan’s major cities. Southern Sudanese will vote in January in a referendum on independence. Some analysts warn that residents hold unrealistically high expectations of what independence would look like, and think the animal and fruit city designs could be a case-in-point. The proposal has yet to receive final approval from the government.